Bootie SF: Mashup Request Night! 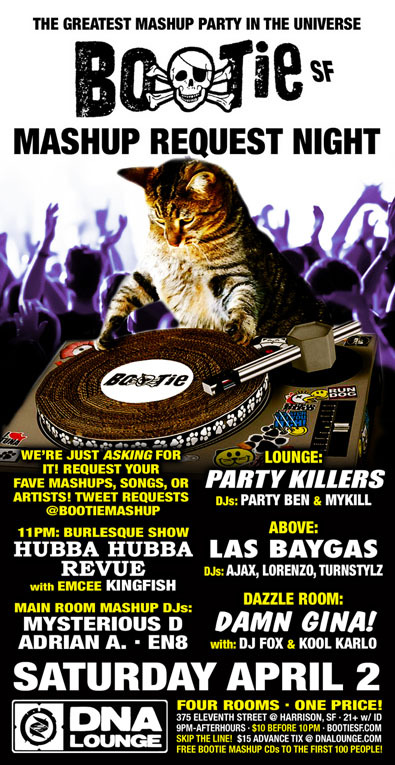 San Francisco Bootie SF: Mashup Request Night! Bootie is just ASKING for it! It’s Mashup Request Night! Request your favorite mashups, artists, or songs, and DJs Mysterious D, Adrian A., and EN8 (formerly of Entyme) will do their best to mash them up! At 11 PM, Hubba Hubba Revue brings their world-famous burlesque to the Main Stage. Upstairs in the Lounge, it’s Party Killers, as DJs Party Ben & Mykill throw down house remixes and more. Above, Las Baygas brings Vegas-style bangers to get you on on the dance floor, while Damn Gina spins super fun dance music in the Dazzle Room! All this, plus drag hosts Holy McGrail and Suppositori Spelling, makeup booth by Marky Makeup, and FREE Bootie mashup CDs to the first 100 people through the door!